Fall in love with Thyme essential oil if you love Mother Nature and trust its innate wisdom of healing. Thyme is such a galvanizing herb and has its use etched in the history of various parts of the universe. When I started with this post, I was just hit with an important term that Thyme is often referred to and that is ‘Mother of Thyme’. This phrase brings out the significance of Thyme in both the conventional and contemporary medicinal practices, chiefly for addressing gynecological problems. Greeks named this plant as thyme meaning ‘to fumigate’, mainly because of its invigorating aroma and it is also said that this name is extracted from the Greek word ‘thumus’ denoting courage. Saints, warriors and scholars of the prehistoric period valued Thyme for its power to grant physical endurance and valor along with emotional and spiritual insight to pursue their life’s vision perfectly. History has a cluster of pages talking about the curative powers of Thyme. Almost all the continents of this world from Antarctica to Australia have used thyme for its impressive medicinal values. Ayurveda, the science of life suggested the use of thyme for its expectorant, astringent, anti-microbial, antiseptic, antispasmodic and anti-inflammatory properties. The ancient texts of Ayurveda suggests thyme for treating respiratory problems, headaches, halitosis, spasms, colic, dental disorders, gastrointestinal problems and few others. 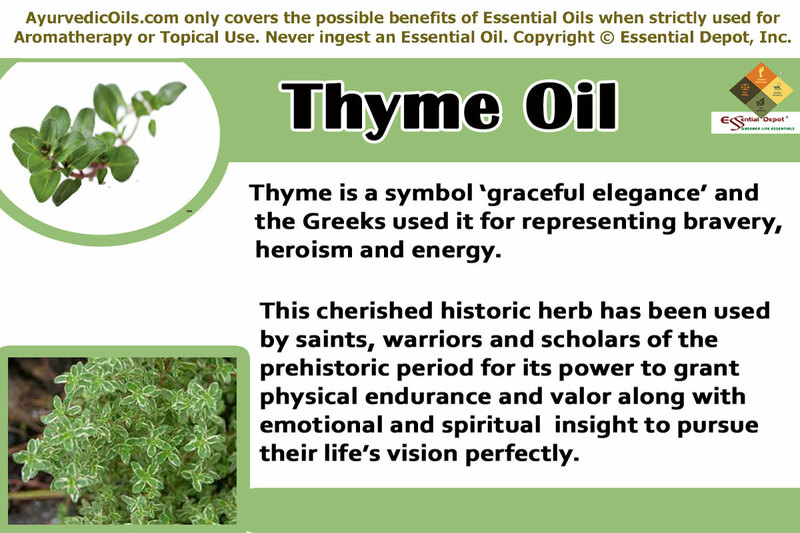 Ebers Papyrus, the oldest Egyptian medical text which dates back to 1550 BC has recorded the healing values of thyme. The ancient Greeks offered thyme as a sacred herb to Adephaghia, the Greek Goddess of food and good eating. Thyme was also burnt in Greek temples for sanctifying and purifying the environment. According to Greeks, thyme signified ‘graceful elegance’ and represented bravery, heroism and energy. Bible honors thyme as the lining for the manger, which was the bed of Jesus Christ at the time of birth. European Pharmacopeia recommends the use of this herb for healing upper respiratory congestion and coughs. Africans use thyme for its tranquilizing properties. It was in use in traditional Jamaican medicinal system to induce labor and support child birth, attributed to the emmenagogue properties of thyme. In southern France, thyme was honored as a sign of extreme Republicanism. Nicholas Culpeper, the renowned English Botanist recommended thyme for treating musculoskeletal problems, warts, ophthalmic problems and certain other illnesses. He said Thyme is “a noble strengthener of the lungs, as notable a one as grows, nor is there a better remedy growing for whooping cough. The primeval Sumerians, Assyrians and Babylonians have used thyme before 5,000 years and the traditional food known as Zaatar in the Middle East countries contains thyme and is popular for its curative values. Ayurveda, the oldest of all healing sciences on earth trusts on natural herbs including aromatic plants for healing human health conditions. It is known for its use of aromatics in treating numerous illnesses ranging from insomnia to bipolar disorders. This healing power by using aroma is connected to the limbic system, which is known as the ‘center of control’ of the human brain. Another celebrated Ayurvedic therapy of healing is Abhyanga, the art of Ayurvedic massaging. Ayurvedic texts strongly recommend massaging with therapeutic essential oils for relaxing the mind, strengthening the immune system and helping the system to strike perfect balance with nature. Essential oils are extracted from plants. They are pure, free of chemicals, highly concentrated and contain the real essence of the plants from which they are extracted. Thyme essential oil is extracted from thyme herb, botanically known as Thymus vulgaris. The most significant constituent of thyme essential oil contributing to its healing properties is thymol. The oil of thyme is regarded as a natural remedy for handling womanly problems in a gentle manner. Historical references report the use of thyme for inducing labor, encouraging easy child birth, irregular periods, obstructed menstruation, treating pains, depression, fatigue and nausea associated with menstruation. This is mainly because thyme oil stimulates the production of estrogen hormones in women, which is responsible for reproductive health. Massaging a blend of 3 drops of thyme oil with 2 teaspoons of sesame oil gently on the abdominal area can grant relief from severe pain and foster blocked menstruation. 2 drops of Thyme oil can also be added to your bathing water for giving a refreshing start to the day and for alleviating fatigue. It can also be used in your diffuser for soothing your senses especially during the night time for a peaceful and relaxed sleep. Ayurvedic Vaidyas strongly recommended thyme oil for treating oral problems like bad breath or halitosis, gingivitis, plaque and tooth decay. Thyme essential oil is known as a powerful germ-killer with its antibacterial and antiseptic properties. This is the main reason for the use of thyme oil in many popular mouthwashes like Listerine and certain other oral cleansers. Thymol, the active constituent in thyme oil along with chlorhexidine is used as a dental varnish for treating and preventing tooth decay. Thyme oil is an important ingredient in popular toothpaste and liniment brands in the market for these special reasons. Adding 1 drop of thyme oil to a cup of warm water can serve as an effective mouth gargle in the morning for treating oral problems. The presence of caryophyllene and camphene components in Thyme essential oil contributes to its antiseptic and antibacterial properties. It helps in protecting the skin from harmful bacterial and fungal infections while effectively aiding in healing burns, wounds, eczema, dermatitis, psoriasis, rashes, cuts and sores. Thyme essential oil helps in keeping the skin free from marks, wrinkles and certain other symptoms of aging. Scars and marks after surgeries, accidents, acne, chicken pox, measles and even stretch marks fade on eventual cosmetic application of thyme oil on the affected areas after blending it with mild carrier oils like almond oil. You can add few drops of thyme oil to your regular face wash for better results as thyme oil has excellent skin-cleansing properties. Thyme essential oil protects the respiratory system from various infections and is a trusted Ayurvedic remedy for treating prolonged coughs and cold. The essential oil of thyme acts as a powerful cough suppressant by checking the coughing spasms. The presence of thymol strengthens the immune system and makes the body defensive against respiratory infections. The warming nature of this oil helps in clearing congestion and breaking up mucous and phlegm. 2 drops of thyme oil added to hot water for steam inhalation can open blocked nasal passages and soothe the respiratory system. It stimulates the functions of the liver and digestive system. Thyme essential oil acts as a tonic for the liver, nervous system, circulatory system and muscular system. This oil assists in treating dyspepsia, gastric formation, heartburn, stomach upset, cramps, nausea, headache and lack of sleep associated with digestive disorders. Intestinal worms like tapeworms, hook worms and round worms can also be discarded with the vermifuge properties of thyme oil. Just like Eucalyptus oil, thyme oil is also an effective pain relieving oil by suppressing the inflammatory COX-2 enzyme. A 2012 study on ‘Effects of Thymol and Carvacrol, Constituents of Thymus vulgaris L. Essential Oil, on the Inflammatory Response’ proved that the anti-inflammatory property of thyme oil is attributed to the rich presence of monoterpene phenols like thymol and carvacrol constituents present in this oil. This makes thyme as an effective pain relieving massage oil in alleviating rheumatic pains, muscular aches, bruises, nerve stimulation, migraine headaches and skin inflammation. Thyme essential oil supports the entire body from head to toe and it is proven effective in treating hair loss, head lice, swelling, throat pain, sciatica, low blood pressure, convulsions, colic, bed-wetting, gout, diarrhea, athlete’s foot etc. This oil is also said to have antioxidant and antiviral properties. It acts as an effective diuretic and helps in alleviating the toxins from the body through urine. Thyme essential oil is extremely beneficial for the heart as it fortifies the cardiac muscles and enhances blood circulation. Inhaling the aroma of thyme essential oil stimulates the mind, improves concentration and uplifts the spirit. And now, you would have realized why I wanted you to fall in love with Thyme essential oil. Let me start. Thyme…. I love you. Disclaimer: Pregnant women, breastfeeding mothers and children below 2 years should not use this oil. Do not ingest essential oils as they are highly concentrated and do not apply them directly to your skin unless it is recommended by your Ayurvedic Practitioner. 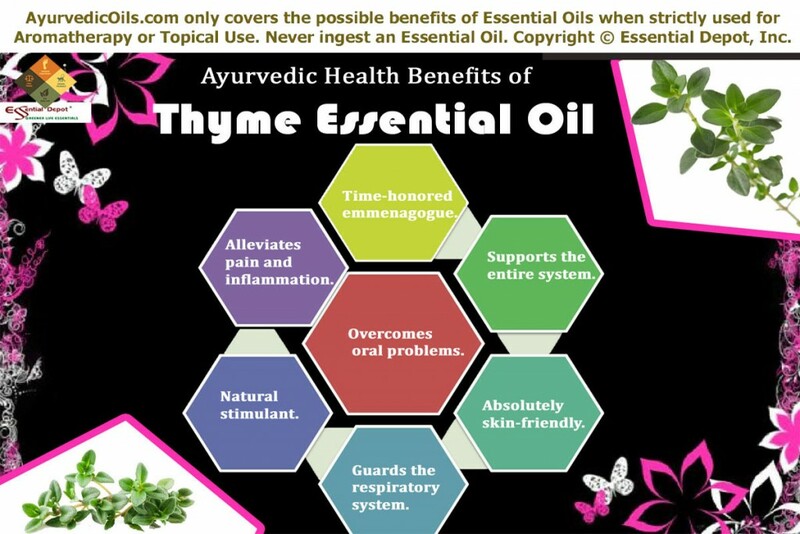 This entry was posted in Ayurvedic Essential Oils, Essential Oils - Learn About and Purchase and tagged Ayurvedic health benefits of Thyme oil, Ayurvedic oils for oral problems, Ayurvedic oils for respiratory problems, Ayurvedic oils for skin care, Chemical constituents of Thyme oil, Essential oils for skin, Health benefits of thyme essential oil, natural emmenagogue, Natural oils for oral problems, Natural remedies for pain, oils for menstrual problems, Oils for pain, Therapeutic properties of Thyme oil, Thyme in Ayurveda, Thyme oil, Thymus vulgaris by AyurvedicOils. Bookmark the permalink.